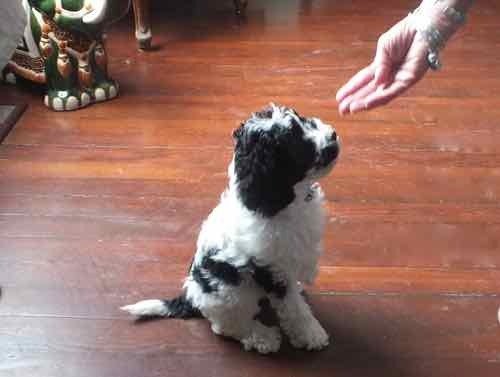 Australian Labradoodles have a naturally happy, affectionate temperament but as with any breed of puppy, they require constant attention and socialization in their first weeks to bring out their wonderful potential. To make sure our labradoodle dogs are of the highest quality we do health testing for both parents. Our puppies come with a health guarantee. 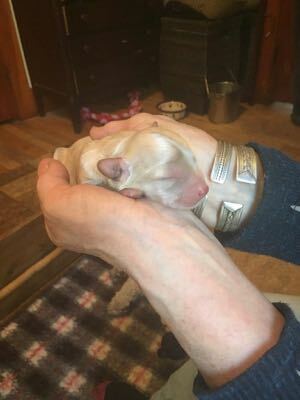 We stimulate newborn puppies to ensure optimum neurological growth using the Bio Sensor program developed by the US military for their working dogs. We also use Tellington Touch to calm our labradoodle puppies as they grow and make their way in the world. Learn more about how these techniques are used as part of the Super Dog Program. Australian Labradoodles have a naturally happy, affectionate temperament but as with a puppy of any breed they require constant attention and socialization in those early weeks to bring our their wonderful potential. A labradoodle is a sensitive dog and training is easy. We begin the training process here when the puppy is very young by having them go through our Head Start Puppy Program. 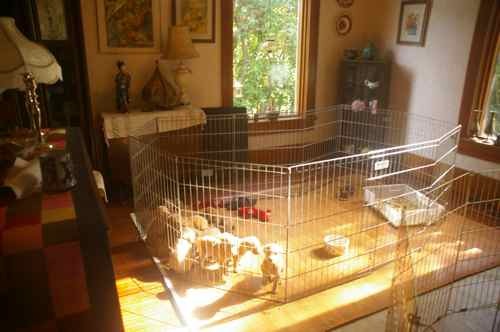 We are often asked if our puppies are raised in the house or an out building. It is a good and important question. These are Guinivere’s puppies when they were little. After three weeks of age they come down from the nursery to their new home in the dining room. Dinner parties are relegated to the garage until puppies are old enough to be part of the household. A letter from a puppy mum who has become our friend through emails and puppy love. I have been meaning to write about how much this now 7 month old puppy has enriched my life. I got Lucca when he was five months and spent a couple of months sending numerous emails back and forth to Jean. I really felt I bonded and got to know him through her and her messages and even videos of my little guy. Lucca is a medium black with the most fun loving nature in the world. He is playful and yet gentle, he is frisky and yet calm and he learns faster than any dog I have ever met. I was told to stay away from the Labradoodle Breed, mostly from people who have not researched and learned that these are not a lab with a high strung poodle disposition. The Australian Labradoodle is a wonderful breed of it’s own and I feel so lucky to have met Jean on line and now have the very best dog in the world ( a bit biased) They have the most wonderful calm nature and they are very smart. Whenever I take him to some ones place they comment on how good and calm he is and how he is welcome back anytime, even for a sleepover sometimes. 🙂 I have also been taking him to doggy daycare and they love him there. They say he has so much fun and that he gets all the other dogs playing and there isn’t a dog there that doesn’t like him too. I told a staff member that he just loved going there as he gets so excited on the way in and she said ” Well we love having him here” and smiled. We are in the car a lot as we live in the city and he does not make a peep in the car. He is so good. We had a little car sickness issue for a bit if we travel too far , but he seems to have been fine lately. I just wanted to express to anyone checking out this breed that if you are serious about getting one of these Doodles you are making a very good decision.